The country house "Brisa de Mar" is wonderfully pretty and peaceful surroundings in a 20 000 large estate, surrounded by a well maintained garden and has spacious terraces exposed, with shady pergolas. There is the equipped with the latest technology pool with non-chlorinated water, which is particularly gratifying for our younger guests because of the extremely friendly to skin and eyes water quality. At the pool there are four sun loungers. The terraces are fully equipped with an outdoor sofa set and a patio table with seating for up to six people. On the ground floor are the entrance hall, the spacious living area with a fully equipped kitchen with small dining area and the living and dining room. In addition, here is a shower room with toilet. A modern iron staircase leads to the first floor of the house. Here are two modern bedroom and two bathrooms, one in suite. Property - Pollensa - beach - TV - Wi-Fi: From the upper floor of the house you can see only a few minutes' drive bay of Pollensa. The property offers peace and relaxation, yet provides easy access to Pollensa the opportunity to enjoy the excitement of the rain village life of the friendly village. The town of Alcudia can be reached from the house well. The beach lovers will also not far away. The beaches of Port de Pollença (Puerto Pollensa) and Cala de Sant Vicenç (Bay of Pollensa) are only about 6 km and 9 km away respectively, the Formentor beach about 20 km, and the beaches of Alcudia and Playa de Muro is approximately 6 km and 10 km respectively away, so be reached in just a few minutes. And if you want to stay on holiday to date: the finca has satellite TV (Astra), as well as wireless Internet WiFi. Terraces, pool & BBQ for cozy evenings: One of the finest homes in the south but is just always the fact that it is possible to enjoy an accommodation in the open air for hours. Is there anything more beautiful than the day with a breakfast on the terrace to begin during the day basking by the pool in the sun or in the shade, only to leave with a nice barbecue expire wine with a glass after a refreshing shower the day. The large terrace is perfectly suitable for this purpose. And one of the many summer nights you have the opportunity to consider the Mallorcan starry sky. A highlight of the 'Brisa de Mar' is the large pool, which allows with its 12 meters unique lap pool. The barbecue is located at this country house in handy in the garden / patio area and near the kitchen, which can be done directly on the terrace. From the living room has direct access to the terrace. The finca 'Brisa de Mar' - property and house: Via a beautifully landscaped driveway leads to the house. Parking for Multiple Cars are available. A massive wooden door leads into the entrance of the house, here is that modern dining room with a large table and seating for up to 6 people. Following the living room with two comfortable sofas, a large sliding glass door provides access to the terrace here. On the right hand of the entrance there is a fully equipped kitchen, with an additional dining area for four. A glass door leads from the kitchen to the large terrace, the barbecue is very convenient just around the corner close to the kitchen. In the entrance there is a guest toilet with shower. From here, a modern Eisenttreppe to the first floor where there are two bedrooms and two bathrooms. The master bedroom has a queen size bed (160 x 200 cm), pretty modern furnishings, a large modern cabinet is available. The bathroom is in suite and is fully equipped with bath, shower bath, hygienic glass partition, sink with counter space and toilet. The second bedroom is furnished with a double bed (2 beds of 90 x 200 cm), although modern, with a large wardrobe and a sofa bed (80 x 160 cm)for a child under 12 years (max. capacity 4 adults, 1 child under 12 y). Of all the rooms you have a wonderful view of the surrounding countryside to the Bay of Pollensa. It's always a nice breeze here, even on hot sunny days, our 'Brisa de Mar' is a newly built finca, tastefully decorated, modern, bright and in a fantastic location. TV, TV Satellite, Stereo, DVD, garden, garden furniture, fenced garden, barbecue, iron, safe, internet (Wi-Fi), hair dryer, alarm, 180 m² property, 20,000 m² plot, air conditioning in all bedrooms, private swimming pool (dimensions 12x4, opening date 19/3, closing date 8/11), Open-air parking. Thank you for being so prompt when things went wrong due to the storms. Clean and beautifully presented. Gorgeous pool and nothing too much trouble. We hope to return! Perfect villa, perfect location. Beautiful views, very quiet and peaceful for a lovely relaxing holiday. Undoubtedly one of the best villa we have stayed in. We had a wonderful holiday here. The house was immaculate and in a lovely, private setting. A beautiful big pool which is unusual in a two bed property. Great to have essentials like oil, salt, bin bags etc etc as soon as we arrive. Would definitely like to stay again. The villa was extremely clean and well presented throughout. Jaume was very welcoming, meeting us at an arranged place and taking us to the villa, also calling in during our stay to make sure all was going well. 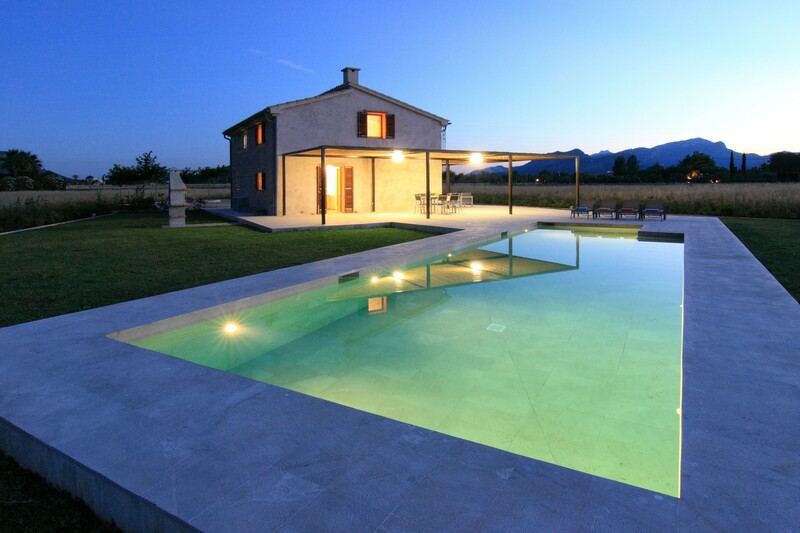 The location is perfect if peace, tranquillity and privacy are what you are looking for. The outside spaces from the shady terraces to the poolside were excellent with fantastic, far reaching views to the mountains. We spent many quiet hours relaxing in the sun watching the birdlife. We were even treated to the eagle who every day swooped around the fields to all sides of the villa whilst hunting. Plenty of great places nearby to visit from the old town of Pollenca with its lovely square and restaurants, the old walled town of Alcudia, the Cap Formentor drive which was very scenic and exhilarating at times. We particularly enjoyed visiting the Monastery at LLuc. 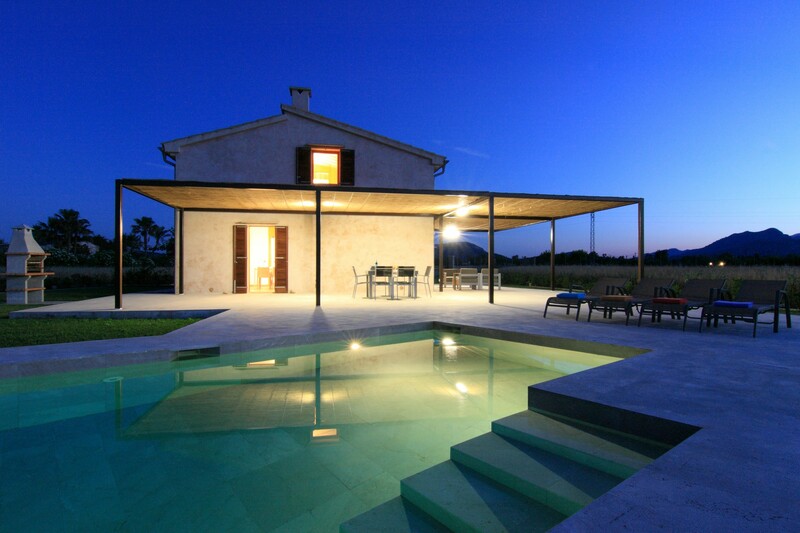 A fantastic villa in a wonderful part of Majorca. Thank you to Jaume and Karin for their help, kindness, and organisation. The location was great and the house absolutely beautiful. It felt a very special place to stay peace and tranquility yet only a short distance from towns and beaches. Karin was very helpful and welcoming. WIr haben genau das bekommen, was wir uns vorgestellt/was wir gesucht haben. Nicht umsonst war die Brisa de Mar bereits zum 2. Mal unsere Homebase auf Mallorca. Die Lage. Die Zufahrt. Die Ruhe. Das Leben auf den Terrassen. Der Pool. Das nahe Pollença.